Tuesday night and Wednesday morning brought our first snow of the winter. It was a windless night, which meant that the snow piled up in impressive layers on top of everything. I was out early, taking Child#1 to school for a trip and the roads near us hadn't been ploughed then. Later, on my way to work, I had to stop to take this photo of the sumacs at the end of our road. I love the way they look after snow. In the days following the snow, the temperature dropped and the sun came out. This morning we woke to -17°C/1°F, which is pretty cold for here in November. In the evenings, the three big silos in the farm next door are acting like a mini-Stonehenge, marking the progress of the sun towards the solstice. I spent some time on Thursday shredding the heap. Two kilos of it are currently being turned into sauerkraut, I blanched and froze another batch and have been using the remainder fresh in meals: a simple braised cabbage for supper last night and as an ingredient in hash browns for breakfast today. I'm not sure how authentic it is as to have cabbage in hash browns, but it seemed like a good way of using up one of the smaller Savoy cabbages (and it really was small - about the size of a tennis ball!). If you have a food processor with a grater attachment, the easiest way to make this is to put the potato and onion through that. Or you can use a regular grater. Put a non-stick frying pan on a medium heat and add the butter or oil. Meanwhile, mix the grated and shredded vegetables together and stir in the flour and seasonings. Once the pan is hot, pack the hash brown ingredients into it so that they form a layer about 1cm/half an inch thick. Then leave it to cook for about seven minutes. After that time, use a plastic spatula to divide the mixture into four (assuming you're feeding four) pieces. Carefully flip each one over and leave it for another seven minutes until the other side is brown and crispy. While I was away there were a few hard frosts which finished off the more tender greenhouse crops. 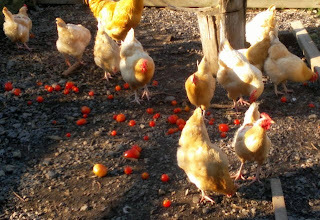 I cleared out all the tomatoes, peppers, eggplants and beans yesterday. There are still some peas, kale, coriander, parsley, and a few carrots, parsnips and beets in there, but there is a lot of empty space now, ready for next year's crops. Talking of which, I received a wonderful surprise in the post recently from Baker Creek Heirloom Seeds. I'd sent them a recipe for their seed catalogue and in return got a paint-pot-tin full of heirloom seeds for next year, including a number of things I've never grown from seed (asparagus, water melon, celery, turnips, and okra, for example). Very exciting, and just what I need as I'm putting the garden to bed for the winter! 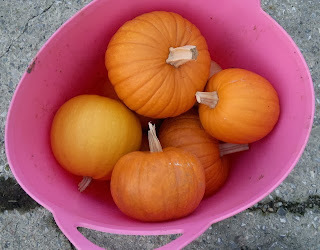 I had some pumpkins curing in the greenhouse, so I've brought those in before they get damaged by the harsher frosts. Though they clashed horribly with the pink plastic trug. Outside, there are still some swedes, kale, cabbages, sprouts and parsnips to harvest. And my trusty sunchokes which will keep providing food in mild spells throughout the winter. Oh dear, over a month since my last post? It's been a busy one, I must say, but I hadn't realised it had been that long. I got home from a short trip back to the UK on Tuesday. The difference in the scenery between there and here at the moment is stark. Here there are very few leaves left on the trees and the main colour is from dogwood branches and the occasional bright berry. Over there, a mild October has meant that most of the trees still have their leaves - and there are still roses in flower! I noticed the berries on this tall shrub at the edge of the highway as we drove to Toronto last week and was pleased to find some on a local road here today. I've tried without success to identify the plant - if you know what it is, please comment! 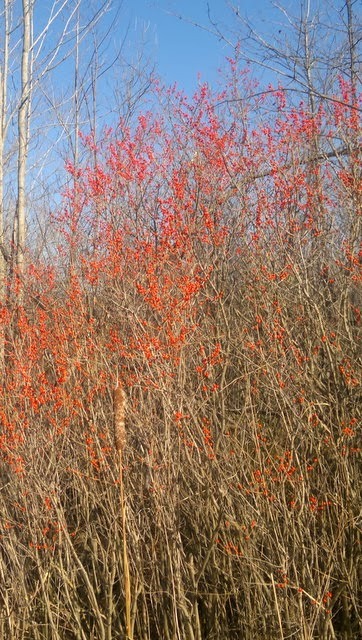 I don't think I've seen it before and the berries are a beautifully bright orange. 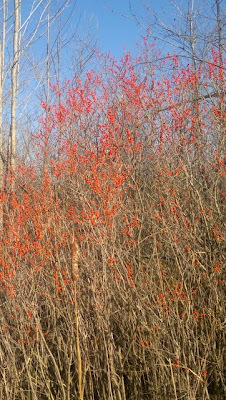 OK, answering my own question here, but I think this plant might be Winterberry (Ilex verticillata). It's certainly well-named!